IBA Centre for Excellence in Islamic Finance (IBA - CEIF) is offering a unique, one day course on Current Developments in Islamic Banking and Finance Regulations and Shariah Governance Frameworks. The course is designed to give the participants an overview of innovative paradigm shifts across various jurisdictions. 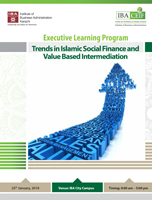 Social Finance, Waqf based Finance and Value based intermediation will be discussed to shed light on dynamic new concepts in a fast changing world. Prof. Dr. Younes Soualhi is a Senior Researcher at the International Shariah Research Academy for Islamic Finance (ISRA) and a Professor at the Global University of Islamic Finance (INCEIF). He serves as the Chairman of the Shari'ah Committee of HSBC Amanah Malaysia Berhad, the Chairman of the Shari'ah Board of Munich Re Takaful, a Shariah Committee member of Bursa Malaysia. He has published more than 18 referred articles and has co-authored 3 books in shari'ah related issues as well as in Islamic Banking and Finance. He has presented more than 50 papers in international conferences. He is actively involved in Islamic Banking and Finance as a lecturer, researcher, trainer and consultant.